Always coverage wherever you are in the world! I have investigated possibilities of internet and telephony over satellite. It is terribly expensive in terms installation and when it comes to operation. I will bring an InReach SE. With inReach SE I have the possibility to write messages directly on the device and then send sms or email independent of mobile coverage. I also receive confirmation when the message is sent. It also gives you the position (WGS 84). InReach SE provides global coverage due to availability of iridium 66 satellites (versus other systems), also in polar regions. Inreach SE can be connected to my smartphone and tablet through Bluetooth. This allows for better keyboard and larger screen. In addition, I can then use this device as a backup navigation system. Use of the satellite communicator requires Subscription from DeLorme. The prices are relatively affordable, it cost me about 20 USD per month. I will display GPS tracking from my InReach SE on the website. Here you will always be able to see where we are. This adds safety. I bought InReach SE at www.mari-care.com. They keep very good prices. The Delorme inReach SE 2-Way Satellite Communicator features a rechargeable lithium battery that delivers about 100 hours of operation when tracking at 10 min. 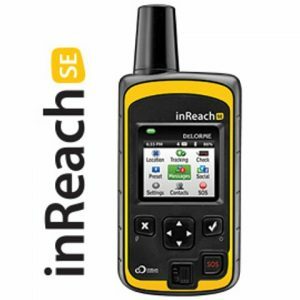 Unlike other popular satellite communication devices, inReach 2-way communication technology allows you to receive and send messages — so you’re continually updated on the status of any search or rescue operation.